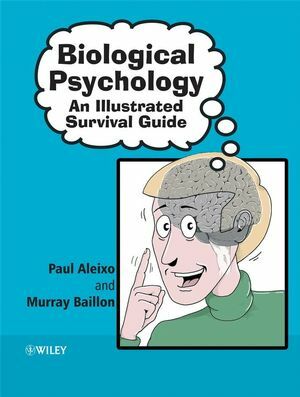 Intended to complement traditional textbooks in the area, Biological Psychology: An Illustrated Survival Guide provides undergraduate and ‘A’ level students with an alternative introduction to biological psychology and an invaluable study aid. Paul has worked as a lecturer in several British universities since completing his Doctoral degree in psychology in the early 1990s. Currently a Senior Lecturer in psychology, he has varied research interests including the application of psychological principles to educational practice. He has taught a number of psychology courses including Biological Psychology for many years. A lifelong interest in comics has led him to explore their use in education. This book is one of these explorations. Murray first met Paul when they were both fresh-faced first year students at University. It was here that they took their first steps as creative partners, writing and performing sketches for student revues. They also both read a lot of comics, which created a shared frame of reference that proved invaluable for this book. After graduating with a B.Sc. in Psychology, Murray then moved into teaching, completing a PGCE at the University of Greenwich. It was while teaching in Singapore that Murray took on his first professional work as an illustrator. He continued to fit illustration work around teaching until recently, when he decided to fit teaching in around illustrating. His work includes fabric print design; logos; cartoons and comic strips for various publications; and children's book illustrations. He has really enjoyed the challenges that Paul set him in this book, as he has never tried to draw things like angry neutrons before. Chapter 1. The Brain and the Nervous System. Chapter 2. Vision and Audition. Chapter 3. The Mechanical Senses. Chapter 4. The Chemical Senses. Chapter 5. The Control of Movement. Chapter 6. Temperature Regulation Hunger and Thirst. Chapter 7. Emotions and Sexual Behaviour. Chapter 8. Sleep and Biological Rhythms. Chapter 9. Memory and Learning.